Don’t start one. And don’t underestimate wildfire’s potential danger. You’re on your own out there. Be prepared. There are tens of thousands of wildfires every year, and because of drought and our changing climate, they’re growing in number, size, and intensity. Between 80-90% of wildfires in the U.S. are started by people. Wildfires can grow extremely quickly. Assess the situation. If it’s windy, and you’re on a ridge or in a forest, be extra cautious. Fire can move like a freight train – many times faster than you can run. Get away as quickly as you can. Especially if you actually see flames. If a fire starts growing quickly, you won’t be able to outrun it. Fire typically moves faster uphill than it does downhill. Avoid being at the top of a ridge with a wildfire below. PCT thru-hikers run for their lives after the Chimney Fire took over a campground. Photo by Elliot Schwimmer. If you find yourself surrounded by smoke, especially dense smoke, it’s time to react. If you awaken to smoke-filled air, try to see which way the smoke is flowing. Use that to determine which direction to go. Do not hike toward the flow of the smoke. If the smoke column is well off the trail and not in the direction you’re heading, proceed with extreme caution. Watch the column. Wind can make wildfire change directions in an instant. Usually, fires are pushed by prevailing winds (normally a southwesterly flow in the west), but winds in the mountains are frequently erratic. During autumn, we usually get north-easterlies. These are hot, dry, strong winds. If you see smoke in front of you and these winds are blowing in your face, the fire will be coming straight at you. If you are at the heal of the fire or on one of the flanks, you will be more able to hike away from it because these areas expand slower than the head of the fire. If the fire is roaring your direction, backtrack and take refuge immediately. Don’t panic. Think as quickly as you can, take into consideration refuges you have passed, make a plan and act. Spread out something large and bright, like your tent rainfly or ground cloth. Orange, red and silver are great colors. Firefighters may be flying airplanes and helicopters, and you’re trying to have them notice you. Wear your most colorful gear. If you are pretty sure you have been seen from the air, stay where you are if it is safe. Firefighters will try to come and get you if they know where you are. Do not start a “signal” fire to help firefighters locate you. The signal you just ignited can easily become another major fire. It’s happened before. In the backcountry, situational awareness is key. Pay attention to where you’ve been. If a fire starts, you might need that information. Find a place with less vegetation or smaller vegetation. A meadow is better than a forest. A flat rock field is better than a meadow. Pumice flats, green grass, lakes, swampy areas are all things to aim for. Flatter areas are better than steep areas, but large, steep, rocky fields are better than brushy meadows. Look at the denseness of burnable vegetation and use common sense. If the fuel at the bottom of a rock field is heavy (dense pine and fir trees), flames are going to sweep up the slope from that fuel. If there are lakes nearby, get in the water and hide behind something to protect yourself from radiant heat. If there are big rocks or islands in the lake or pond, hide behind them. The crystal clear water we love from alpine lakes does not block radiant heat as effectively as murky water will. Avoid chutes and saddles at all costs. A chute is a ravine that runs perpendicular to a ridgeline and channels flames straight up to the ridgeline, increasing fire intensity many times over. A saddle is a low spot on the ridge. Fire is channeled toward chutes and saddles, substantially multiplying intensity. If you are hiking a ridgeline and discover fire below you on one side of the ridge, take refuge on the other side, away from the fire. Remember, fires typically move upslope quickly. Stay low to the ground. Smoke is toxic and the air will be better down low. Hide behind anything that will not catch fire immediately. Dig a hole for your face and keep your nose in the dirt. You’ve come across someone’s smoldering campfire. Do this. Be a PCT hero and put out other people’s unattended campfires. Did you walk by someone’s smoking firepit? Please put it out before it gets out of control. If you see a very small fire, like an escaping fire ring that was left unattended or a log burning after a lightning strike, try to put it out. Use lots of water. The fire might be burning underground in the roots of the trees or bushes, or in the duff of the forest floor. It might be hard to put it out without a shovel. Thanks for trying your best. Assess the situation. You might need to call in help and exit for your own safety. Is there a campfire ban on this particular forest or park unit? Any restrictions or warnings about smoking? These are signs of severe fire danger. Are there any red flag or fire weather warnings? What’s the threat level for the area? Are there any permanent fire restrictions for the area? Perhaps no fires above a certain elevation? Or no fires in Southern California? This is fundamental. You’ll need to know what the drainages look like and where the trail will lead you. If you head north on the PCT, will the trail curve toward the fire? Is the fire likely to head upslope toward the trail or away from it? Carry paper maps. Make sure your maps show alternate trails. Many PCT maps are so zoomed in that they don’t. This can be a hard one. The Forest Service PCT maps are a pretty good scale for this in most places. But in others, you might carry something like the maps from Trails Illustrated, Green Trails, or even the plain old National Forest maps. 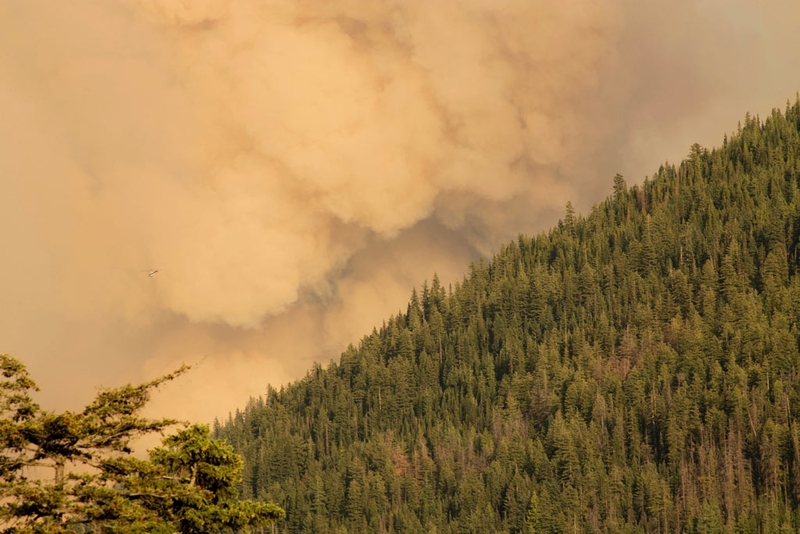 A smartphone loaded with largescale maps is a good addition to your paper PCT maps – but if it’s your only map you’ll be in real trouble when faced with a dead phone while there is a wildfire around. 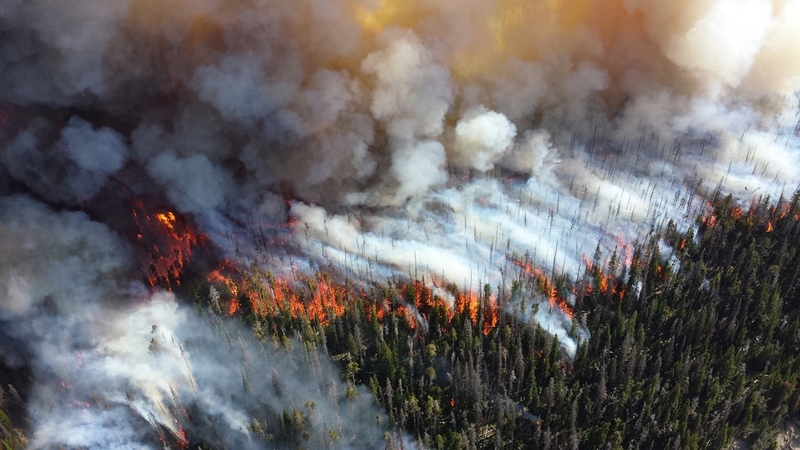 Being well prepared is even more important during the summer monsoon season and during droughts, when wildfires are more likely to spring up quickly. It’s also more important when you’re in more remote stretches of the PCT. PCT hikers tend to assume they need to go north or south on the PCT to get to the nearest town. That’s not often the case. In an emergency, your maps will show you the side trails that drop off the PCT to the nearest road. Note your location. Do you have GPS coordinates? The mile marker on the PCT? The name of the National Forest, the ridge that you’re on, the drainage that you’re near? Provide as much information as you can. Calling 911 is appropriate. Call 911 in an emergency or if there is a significant fire that you suspect hasn’t been reported yet. In less severe situations, you can also call the local county sheriff. And call the local Forest Service or National Park Service office. Some of these offices won’t be open nights or weekends. Same with the PCTA, we’ll help get the word out to local agencies and the hiking community in anyway we can. A morning meeting while fighting a fire on Sequoia National Forest. USDA Photo by Lance Cheung. Heavy smoke can kill you quickly. And smoke can change quickly, becoming much thicker as the wind shifts or grows the fire. 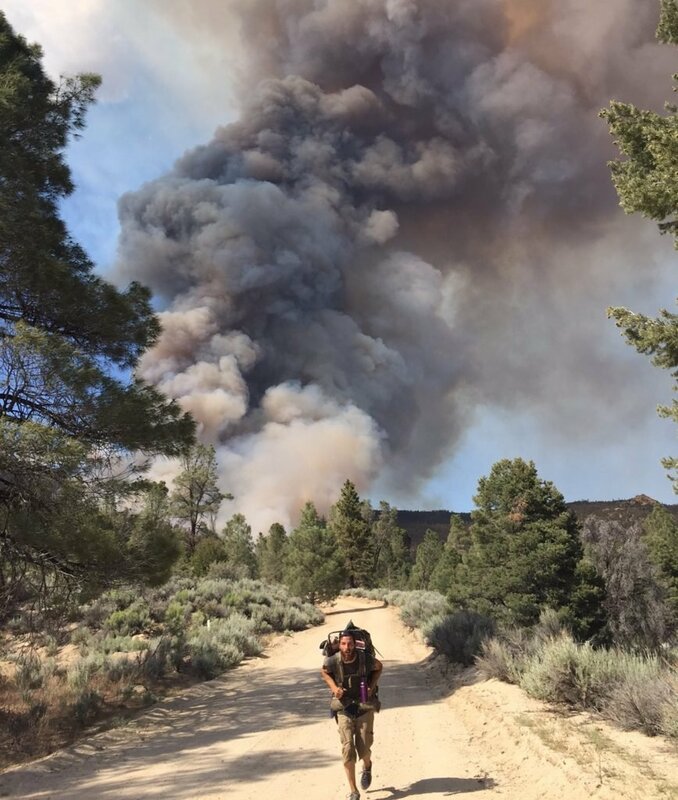 But even when there isn’t a direct threat of flames, and the trail is technically open, thick smoke might make it a seriously bad idea to be out hiking. It’s not a time to be exercising and inhaling deeply. Smoke is unhealthy even when it’s not an immediate threat to life. Burning embers are often flying with the smoke. Thick smoke might signal the added danger from burning embers falling around you and starting new fires. Trust your gut of course. But do you really have the knowledge and experience to risk it? Don’t panic, but play it safe. You almost certainly don’t have enough information or experience to understand the chances you’d be taking by ignoring the early warning signs. The trail will still be here next summer. Come back when wildfire and smoke aren’t ruining your experience. These are life-threatening events, so take heed and act accordingly. Hot shot crews heading out to fight fire on Klamath National Forest. U.S. Forest Service photo by Kari Greer. Obey fire closures. Firefighters are fighting a wildfire – they don’t need the distraction of dealing with you in the closure area. It’s an emergency. Let them work without needing to divert resources (employees and helicopters) toward tracking you down, keeping you safe and getting you arrested. We steward a database of trail closures here. You might not understand the logic of closure boundaries, but there is detailed planning and science behind it. Officials take into account the current fire, terrain, conditions, the projected growth of the fire, the resources available, the evacuation routes and other things. 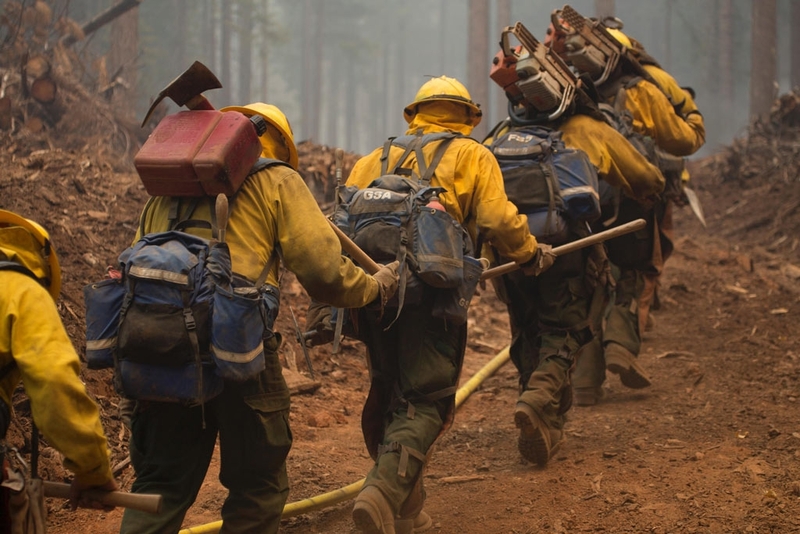 Professional wildland firefighters know their craft – trust their expertise. You might be dealing with a fire before firefighters know about it. Trust your gut. Don’t wait for an official closure of the area. Act. Commit to this: drown all fires with water. Dump a ton of water on it. Stir. Make sure all of those coals are soaking wet. Stick your hand in the fire pit and feel it. If it’s still hot, use more water. This is the only responsible way. Before you start a campfire, think about whether it’s a safe place and time to have one. How windy is it? Is there a large area of bare ground, or is the area covered in dry leaves or pine needles? Are there low hanging tree branches? Bushes nearby? If you’re not within reach of a water source, don’t have a fire. You need gallons of water to put out a fire and many more if your fire starts burning the bush nearby. Don’t have a fire without a large supply of water. Your water bottle isn’t enough – and you’ll need that to drink anyway. Do you smoke? Make sure you’re putting your smokes out on rock or bare dirt. Not on trees. Also, don’t smoke while walking. Remarkably, it’s often banned because it’s just far too easy to drop some ash on nearby grass. Take a break and sit in a bare ground area instead.